Oheka Castle is arguably one of the finest venues for a wedding ceremony and reception anywhere in the world! I have had the privilege of creating beautiful wedding photographs at this magnificent location many times in my career as a professional wedding photographer. From the grand staircase at the entry from the cobblestone courtyard, to the spectacular vintage interior architecture, to the perfectly manicured gardens and grounds OHEKA is any bride’s dream and every photographer’s paradise. This picture was taken at a winter season wedding when Mother Nature did not permit an outdoor wedding ceremony on the grounds by the reflecting pool. The ceremony was set up indoors at Oheka in the main level formal dining room. The intimate candlelight ceremony was accented by beautiful floral decorations and an exquisite huppah along with the room’s chandelier and wall-mounted crystal sconce lamps. To say the design was elegant would be an understatement. Oheka is known for their extravagant catering of extraordinary events and this one was no exception. 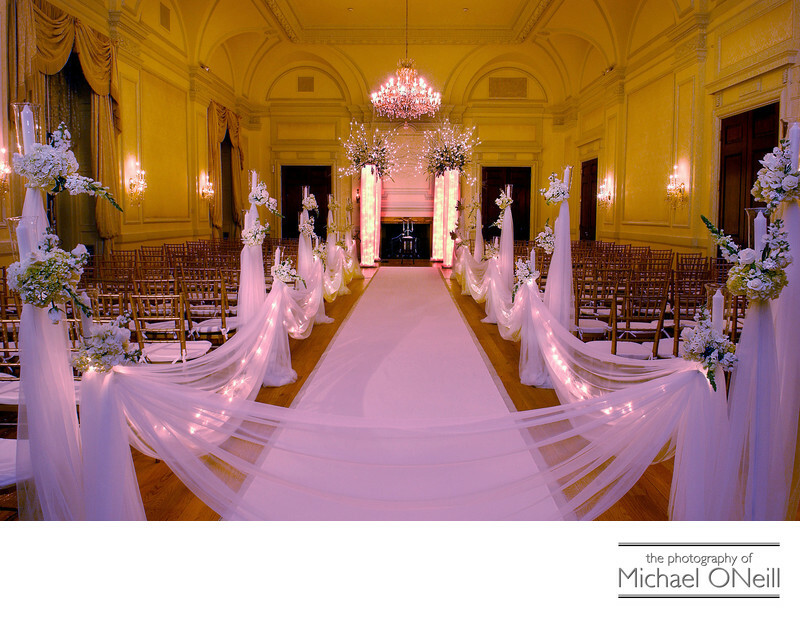 I love creating stunning wedding pictures at Oheka Castle and cherish every opportunity I get to photograph there. There are just so many fantastic different locations both inside and outside the castle that I could easily spend all day taking romantic, elegant and contemporary photographs of the wedding couple, their friends and families. As an added bonus Oheka is located less than 15 minutes from my East Northport, New York studio and gallery so it is close and convenient for any couple planning an Oheka Castle wedding. If you are planning such a wedding and are looking for an extremely creative photographer with extensive experience working at Oheka Castle you need not look any further than my studio. Give me a call and we’ll set up a convenient time to talk about your plans and wishes for the big day.